The new Adonia arrived in Southampton on Friday morning. (I blogged about her transfer to P&O in this post when it was announced in December 2009.) She was, apparently late arriving (due to bad weather across the Atlantic) but in the event she was berthed by just after 8:30. Approaching Southampton from the west, she came up the Needles channel rather than around the southern and eastern sides of the Isle of Wight – that’s the first time I’ve seen a P&O ship do that. Obviously this is a result of her smaller size. I have to say, however, that when Carol Marlow made this comment about Adonia in December 2009 “More importantly though, she will be able to travel to some of the most intriguing “off the beaten track” destinations, so you’ll still be able to visit ports that the bigger ships can’t access“, I didn’t think I was expecting that this would include Yarmouth IoW! Andrew Sassoli-Walker had his camera to hand as she arrived in Southampton on Friday morning (he often does on significant mornings for that port) and took a number of fine pictures. You can find a gallery of them here. 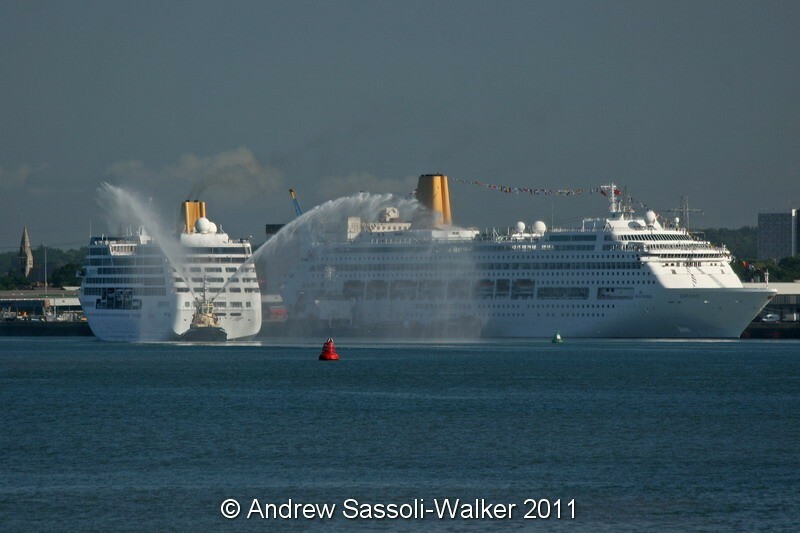 I have taken the liberty of inserting one of them (of Adonia passing the already-docked Oriana) into this blog: as ever, the image is copyright Andrew Sassoli-Walker. There’s also a YouTube video I’ve spotted, taken from Ventura (which docked at the end of a Fjords cruise on Friday morning). You need to wait until about 1 minute 30 seconds into the video before Adonia makes an appearance.